Vector illustration of Stonehenge for your ancient building, prehistoric ruin, druid, religious mystery, world wonder, English countryside, travel and tourism designs. Historic site of Stonehenge, estimated at 3,000BC, under a red evening sky with abstract moon. Stonehenge is one of the wonders of the world and this stylized vector image features the mysterious location. Silhouette graphics on a sunset horizon with black frame. Free download for your mystical themes, travel ads, desktop wallpapers and custom postcards. 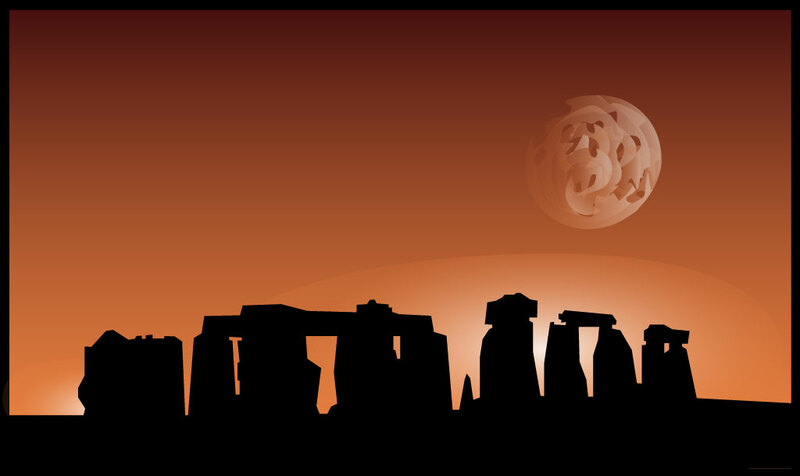 Tags: Druids, Monument, Mystery, Prehistory, Ruins, Stonehenge Vector, Uk.